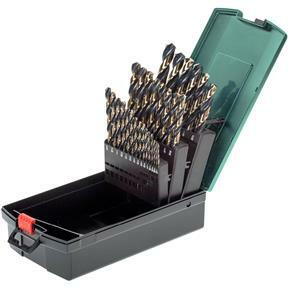 This 29-piece HSS Drill Set features a black and gold oxide finish for enhanced hardness, corrosion and wear resistance lasting up to 3 times longer than standard bits. Features include 135° split-point bits with precision ground flutes for quality edges and efficient chip removal. Includes fractional sizes 1-16" - 1/2" in 1/64" increments.